Social Media, The New Weapon In The Battle To Lose Weight : Shots - Health News Liz Paul has struggled with her weight for years. A diet group helps, but it only meets once a week. So she has turned to social media for daily feedback and support. Studies find it can help. Photos from Liz Paul's blog entries on Prior Fat Girl. The blog chronicles women's weight loss journeys. On a recent Sunday night, Liz Paul was tired. She'd worked in the morning, spent a full day with her family and she did not feel like going out for her daily jog. "I tweeted out, 'Well, it's 9 p.m. on Sunday and I didn't work out,' " she says, "I really shouldn't go run in the dark should I?" The response was immediate. The network of people Paul is relying on to help in her battle to lose weight chimed in with advice. Some tweeted back, "Yes, get out and run." Others offered alternatives like a video workout. But everyone said, "Do something!" Paul, who is 35 years old and lives in Eagan, Minn., got up and went for a three-mile run. "I wouldn't have done something if it was just me," she says, "I would have given up. I would have said 'Oh well, I'll do it tomorrow.' "
Several studies, albeit small ones, show that social networks like Facebook, Twitter and Instagram can help bolster weight loss. Researchers in London recently analyzed 12 studies involving nearly 1,900 people in the U.S., Europe, East Asia and Australia. They found those who used social networking sites lost modest but significant amounts of weight. It's the social push that helps make people accountable, says Christopher Wharton, assistant professor in the nutrition program at Arizona State University. And accountability can be a powerful motivation to stay on track with a weight-loss plan. In-person support groups definitely help, he says, but most only meet once a week, while social media is ubiquitous. "Even though you are virtually dispersed," he says, "you can sign on to those platforms multiple times a day and talk about your progress, your perceived failures, and immediately receive support from friends and other acquaintances who are connected to you." Wharton says people can also take advantage of some easily downloaded phone apps to help them keep track of what they eat. In a recent study, he found a smartphone app was the best way to tally up the day's calories, which is key to weight loss. "That might have something to do with how easy it is to pull a phone out of your pocket or purse and type in information and then be done with it," he says, "rather than carrying around paper and pencil and manually writing things down." Liz Paul, who has lost more than 100 pounds since giving birth to her second child last November, is taking her digital weight loss efforts one step further. She now blogs about her struggle with weight in the blog Prior Fat Girl. 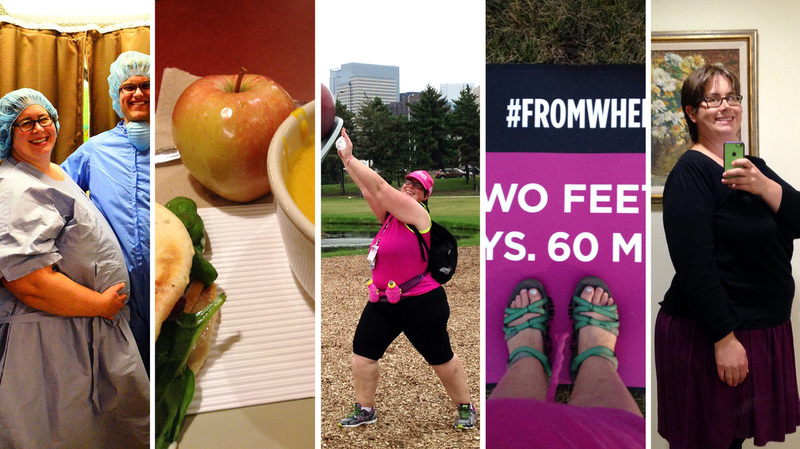 One recent post helped her figure out why she felt like eating, "everything in sight." As she wrote she realized she was overly anxious and stressed. She started blogging about the behavior and ended up discovering what the root cause was. Once she understood that, she says, she was able to get back on track.